I wanted to give a shout out today to all the men and women serving in our armed forces. Thank you for doing what you do, so I can do what I do! More specially, I want to mention that my sister Heather started her first week in Commissioned Officer Training for the US Air Force in the Medical Service Corps. She has probably definitely been the biggest supporter of my blog from the day I began. I know a nail blog might not seem like such a big deal, but I have gone through some serious ups and downs. Her support has meant the world! I am so proud of her for going on this journey, and for supporting our armed forces and country. One week down, four more to go away from her husband and two precious kids. I can only imagine what that sacrifice is like. I'll be sending up a lot of prayers for her these next few weeks. I'm sure she'll need them, it will be a tough road ahead. Be brave! Be strong! Way to go sis! Labels: military, shout out, USA! Hello everyone! How ya'll doing? I can't believe it's going to be June tomorrow! It seems like winter lasts a lifetime, and then before you know it, it's 100 degrees and I'm dying from heat stroke. I'm just so glad that I live in such an arid climate and don't have to worry about humidity! Yesterday there were storm clouds hovering that raised the humidity to probably something like 3%, and it was getting uncomfortable. Haha. Well I know talking about the weather is so fascinating (okay, but it seriously is for me), so we will move on to the nails..
Hello lovely ladies! Today I have some simple nail art that anyone could recreate. I've fallen in love with nail art since I started my blog last year. I get so excited when I pull off a mani that is super complex and detailed. Sometimes though, I need something that's a little more wear-able. The morning after I did these (I almost always do my nails late at night) I wasn't sure what to wear, but then I found an outfit that coordinated perfectly. I love it when that happens! Poshinality is a new brand in the indie scene, based in Los Angeles. They had a big launch last month with a lot of bloggers participating. It was hard not to notice the swatches of Mystery on Nailz Craze (beware, Natalie's amazing photos will make you want to buy anything and everything she photographs) and I had to have it! So I checked out their site to see what else they have to offer. They have mostly traditional shades in a good mix of cremes, shimmers, glitters, and nail treatments. Polish Is All About Personality. You have a right to feel comfortable in your own skin, personality and style of fashion. No matter how glamorous. No matter how simple. True beauty, confidence and self-worth come from within you. No one can be you but you so be you, do you, and love you unconditionally. What more can I say? How about nothing, so we can get on to the photos! Wow, is it finally Friday? This has been a long, busy week for me. I've been running around so much, that I'm determined to stay home today and do as little as possible! Okay, maybe not, but I am trying to keep it easy. Plus, it's that time of year again where the air is thick with swirling cotton from the cottonwood trees. I'm talking white-out blizzards of cotton. That alone is huge motivation for staying inside. And when I am forced to leave the house, lipgloss is not an option! This nail of the day is China Glaze Ahoy! from their Spring 2011 collection. Ahoy! is a gorgeous raspberry red glass fleck. Even with the squishy jelly base of this polish I was able to get it this opaque easily in just two coats. Howdy everyone! How is life treating you this fine day? I am still trying to get over waking up from a cruel dream I had last night. I was dreaming that I was nail polish shopping, and there were rows and rows of Essie and OPI bottles on clearance. Just as I my basket was getting full of delicious goodies that I've wanted for so long, I woke up. Then came the sad moment of realization that it was all a dream. *sob*. Should I be admitting that I'm so obsessed that this is what my literal dreams are made of? Don't worry. The day I am visited by the Ghost of Nail Polish Past, Present, and Future, is the day I seek professional help. Today I have Part 2 of my Brijits Digits swatches. Last week I showed you Dandelion Wine. If you haven't seen that post yet, go take a look first. That's okay, I'll wait. Done? Okay. This time I have two more pretties, Bluebie Spritz and Enchantment. I'll just get straight to the swatches! Hello everyone! Today's post is short and sweet. Enjoy! Hello Ladies! I have a Brijits Digits polish to show you today! Brijit is a fellow nail blogger who has her own Brijits Digits Boutique, selling nail polish, jewelry and more. After visiting her blog many times I finally took a look at her Etsy shop and fell in love with Dandelion Wine. Then, to justify the shipping costs, I added another beauty, Bluebie Spritz to my order. Today's post is one that I started weeks ago. With the unpredictable Spring weather, the sunshine has been sporadic and not at all ideal for outdoor photos. We finally got some full days of sunshine so I could really capture the beauty of these polishes! The plan was to showcase all three polishes in one post, but I just made a last minute decision to break this up into two posts. Just for the fun of it. Also, I'm still pretty lightheaded from donating blood yesterday and don't have a lot of brain power right now! To begin, here's what it looked like when I opened my box. So cute! Last week I got my MoYou London prize in the mail! I won it in a trivia contest they had on Twitter. I love trivia, so the prize was more of an afterthought. That is, until I won it. I was totally giddy about getting to choose from their Pro Collection stamping plates. I chose the XL 14 plate specifically for the tulip pattern. When I asked on my facebook page which stamp from the plate I should do first, the tulips was the first response, which is what I wanted to do anyway! If you've spent anytime at all browsing nails on Pinterest, you've seen something like this. I've never done a mani quite like this, with the densely glittered nail. Yesterday I went to Sally Beauty and found these three polishes on clearance. When I brought them home I realized how great they looked together. It was destiny. I instantly thought of the manis I see on Pinterest all the time and figured it was worth a try to see if I liked it. Well, there is a reason there a bijillion manis like this. Because it's so darn sparkly and lovely! Happy Monday everyone! I hope you're all having a great start to your week. I've been a little really stressed out about singing a solo this Thursday at a church event. I love singing, that's why I'm in the choir, but I'm no soloist. So why did I agree to this? I don't know. Because I love to do things that terrify me and make we want to puke just thinking about it? Hmm.. actually, I do. YOLO! I've said this before, but thank goodness for nail polish to take my mind off of everything else! This color combo is especially bright and calming. It brings me to tropical islands and crystal clear waters. Places I've never been to, but I've seen pictures! Okay, I have been to Hawaii, but I don't remember the water looking like this. 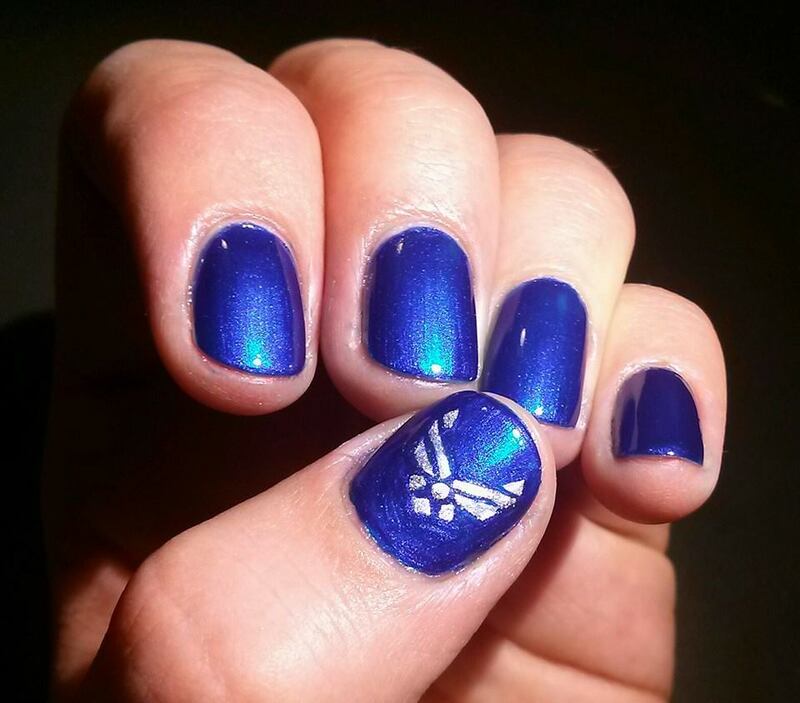 If you're feeling stressed out with finals, kids, work, performing things you have no business doing, you can put this mani as your computer wallpaper and stare into while listening to a sound machine with ocean waves. I bet that will help. I've had this design in mind for weeks and finally had the courage to try it. I say that because I have never tried any of these designs before, and I get intimidated by trying something new. I have this bad habit of being afraid of failure. So I bit the bullet, spent a couple hours on it (or more), and here is the finished product. I am so happy to say that this mani came out just as I had envisioned it! I had been thinking about the theme of Spring and that led to the idea of bugs. I thought it would be cool to do another macro design like the one I did for my black and white animal prints. I wanted to think of a fifth bug, but couldn't come up with one that would be easy to do or not totally creepy. So I went with a snail instead because they are kind of adorable. Here's the long list of polishes I used. I used the same black on each nail, Sephora by OPI What's a Tire Jack? What do you think? Would you try this mani yourself, or maybe just one of these designs on all of your nails? Would you like to see a tutorial? I hope you enjoyed the post. Have a great weekend! Please show some love and follow me on facebook, twitter, bloglovin', or pinterest! And thank you to all of my loyal readers. You guys are the bestest!! Yay! It's May! That means the temperatures are getting warmer, the days are getting longer, and I can spend more time outside. The weather was absolutely gorgeous yesterday and I was compelled to break out the neons. It's not summer yet, but being the 2nd of May in Utah, it will be here in a flash. For this mani I started with a base of white polish so the neon would really pop. Then I prepped around the nails with Vaseline to make cleanup faster. I still don't know if I prefer this method, or just using tape. The Vaseline can be really messy, but the tape can ruin the polish if you don't take it off carefully enough. Then I commenced with the water marble using Forever 21 Neon Green, Finger Paints Pink Perspective, and Sinful Colors Coral Riff. For more information on how to water marble, check out my Distressed Water Marble Tutorial and just skip the distressing part. I love water marble manis because once you've found polishes that will work, it's pretty quick. Even when you mess up the same nail twice (my ring finger couldn't get it together), it doesn't take that long. Especially compared to other nail art I've done. I'm looking at you spiraling dots! I think I got this done in about an hour. With more practice I'm sure I'll be even speedier. What do you think? Do you like wearing a mani that refuses not to be noticed? I found these little cuties while I was outside taking my photos. So when does summer officially start in your book? Once the weather reaches a certain temperature? Once your kids are out of school? When the calendar says it is? For me summer always arrives on Memorial Day Weekend, when my pool opens!